Portrait for commission. Portrait from photo for commission. 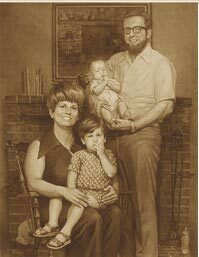 Commission of portraits and paintings. Portrait from the photo for commission. Check, please, if all the fields are filled in. All the owners of the discount cart of the art-studio "Portret.com.ua" while making the order can receive the discount of 5% from the full price of the order. The cart is accumulative and in furute can rise to 10%. For receiving the discount while making the order you have to show the cart or to inform the manager its number (in case you make order through our site). The studio "Portret.com.ua" reserves to itself the right to change the terms of cart acting, conditions of the receiving the cart and conditions concerning discounts, to alter rules of the cart usage without informing its owners and realization of its exchange previously informing the owners or without the previous informing. * - The information given by the client for receiving the discount cart is confidential and can be used by the art-studio "Portret.com.ua" only.